In Mexico City, Mexico, where I live, it is now see time! I hold a PhD in Computer Science. My main area of interests is computational linguistics (natural language processing; see an introductory book, an introductory text in Spanish and another introductory text). Research Professor and Head of the Natural Language Laboratory at the Centro de Investigación en Computación (CIC) of the Instituto Politécnico Nacional (IPN), Mexico. Member of the Mexican Academy of Sciences, founding member of the Mexican Academy of Computing, and National Researcher of Mexico (SNI level 3, the highest). Honorary Professor at the Amity Institute of Information Technology (AIIT), Amity University, Noida, India. Adjunct Faculty at the National Institute of Technology Mizoram (NIT Mizoram), Aizawl, India. Senior Researcher of the International Laboratory for Intelligent Systems and Structural Analysis, National Research University Higher School of Economics, Russia. Invited Professor at the Institute for Modern Linguistic Research, Sholokhov Moscow State University for the Humanities (2013–2015), Russia. 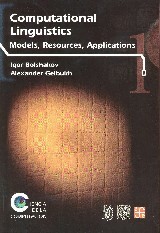 Researcher, All-Union Scientific and Technical Information Center (AUSTIC, 1998–1992). Part-time teacher, Moscow State University (MSU, 1995–1997), Russia. Visiting researcher at the Research Institute in Information and Language Processing (RIILP), University of Wolverhampton (2018–2019), UK. Invited Professor of the PhD program on Systems and Industrial Engineering (DIS), National University (UN), Bogotá, Colombia. Member of the research team of the Sentic Lab at Nanyang Technological University, Singapore. Inaugural Distinguished Fellow of the International Engineering and Technology Institute (IETI), Hong Kong. Member of the Machine Intelligence Research Labs (MIR Labs), USA. Member of the Social Networks Research Center (SoNet RC), Mendel University in Brno (MendelU), Czechia. Collaborator of the L.N. Gumilyev Eurasian National University, Kazakhstan. Visiting Scholar at Waseda University (2010–2011) and Invited Researcher, Media Network Center of Waseda University (2011–2014), Tokyo, Japan. Distinguished Visiting Professor at Chung-Ang University (2003–2004), Seoul, Korea. My CV lists my publications, projects, and awards. I have h-index 40, with more than 6300 citations (I have checked manually first 2000 citations to my papers that are not self-citations). According to Springer's rating, I am one of the most productive authors in Artificial Intelligence and Computational Linguistics, and one of the most productive Mexican computer scientists. According to Google Scholar, I am within 100 most-cited authors in Computational Linguistics. My Erdős number is 3 or 4 and my Dijkstra number is 5. My Microsoft Academic Search rating is 10 in NLP, 7 in DB, 4 in AI. See info about me in DBLP, DBLife, ResearchGate, LinkedIn, Wikipedia. I am the founder and chair of the CICLing International Conference series. I have been Honorary Chair of ENC-2008, Program co-chair of some recent MICAI, CIC, CORE, and some other conferences. 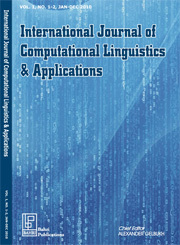 I am founding Editor-in-Chief of the International Journal of Computational Linguistics and Applications (IJCLA) and Editor-in-Chief of the journal POLIBITS. My academic genealogy is simple: my PhD advisor was Prof. I.A. Bolshakov, DSc, who had no advisor. I have been, or currently am, advisor of more than 25 PhD students who are citizens of 11 countries: , as well as more than 25 MSc and BSc students. I supervise, or have supervised, theses in . My students have received important awards because I taught them my key to success. All my students receive good scholarship. CIC's PhD and MSc programs are certified as international-level quality programs, which implies that our students (including foreigners) receive very attractive scholarships (see details). Foreign students can apply for an even higher scholarship to study with us. As examples, see some of my courses. To help students to better choose their research topic, plan their research, present their findings, and write papers, I prepared a presentation on Do-s and Don't-s in your PhD (and not only in PhD). There is a lot more to say about it. You may want to invite me for a talk on this topic. PerSent: Persian sentiment analysis and opinion mining lexicon: polarity for about 1500 Persian words. See also my other research projects. See also: Useful NLP links; ACL, AI-Tech Web directory; Sentic computing, Beall's list of suspicious publishers. My name is A. Gelbukh, Alexander Gelbukh, Alexander F. Gelbukh, A. F. Gelbukh, Александр Гельбух, but people sometimes incorrectly spell it as A. F. Gel'bukh, A. F. Gel'bukh, Alexandre Guelboukh Kahn, Alexandre Felixovitch Guelboukh, Gelboukh, Guelbukh, Gelbuch, Guelbouch, Gelbouch, Guelbuch, Gelbuk, Guelbouk, Gelbouk, Guelbuk, Gelbuck, Guelbouck, Gelbouck, Guelbuck, Gelbuh, Guelbouh, Gelbouh, Guelbuh, Gelbuckh, Guelbuckh, Gelbouckh, Guelbouckh. Keywords in Spanish: procesamiento de lenguaje natural, procesamiento de texto, lingüística computacional, inteligencia artificial, Doctorado, Maestría. See also International Conference on Computational Linguistics and Intelligent Text Processing, Natural Language Processing, Human Language Technologies. See also my file list and site list.